Nepeta, Catnip and ‘Catmint’ are perennial herbs or flowering plants used in garden borders and as an insect repellent. Giant Catmint Nepeta ‘Six Hills Giant’ is one of the better known cultivars. And if you are looking for a hardy drought tolerant plant that that is easy care, then this is a genus worth looking at. Nepeta x faasenii ‘Walkers Low’ and ‘Six Hill Giant are two popular varieties. Both drought tolerant, long flowering and easy care ground cover plants. Catnip which is Nepeta cataria is less ornamental than catmint which is Nepeta mussinii. However the many cultivars that are available are best looked at for their own qualities. Not all species are the real ‘Catnip’ just the one. 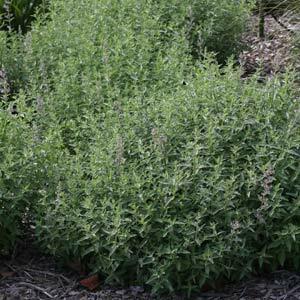 Catnip plants are the species Nepeta cataria. These are an interesting plant, some cats just love it and will roll all over it and play with it. They are a perennial herb and are easy to grow. Not only useful to keep the cat amused but also a great garden plant as well. Nepeta a great border plant. Attractive green to grey foliage, white, blue to lilac tubular flowers. Nepeta ‘Souvenir de andre Chandron’, with sky blue is a spectacular Nepeta, with large flowers and leaves. Nepeta ‘Six Hill’s Giant’ is a taller growing variety. Nepeta mussini also acts as an insect repellent. N. citriodora is a lemon scented catmint. This is a tough drought tolerant plant once established. Long flowering and in a good well drained humus rich soil requires little care other than light pruning to tidy up. An all purpose slow release fertiliser once or twice a year is usually sufficient.